Figure 9.4. Localization of the mRNA-binding site of the ribosome in the "neck" region of the small ribosomal subunit by immuno-electron microscopy technique. A: Electron microscopy photographs of the complexes of the 70S ribosomes associated with hapten-linked poly(U) with hapten-specific antibodies. Upper row: ribosomes connected by the antibody molecules into dimers. Middle row: single ribosomes interacting with the antibody molecules. Lower row: ribosome model with arrow-heads indicating the antibody binding sites on the 70S ribosome in two projections. (A.G. Evstafieva, I.N. Shatsky, A.A. Bogdanov, Y.P. Semenkov & V.D. Vasiliev, EMBO J. 2, 799-804, 1983. Original photos are kindly provided by V.D. Vasiliev). B: Schematic contour drawing of the 30S ribosomal subunit with mRNA-binding (decoding) site in the "neck" region. Positions of several ribosomal proteins are indicated by dotted circles. 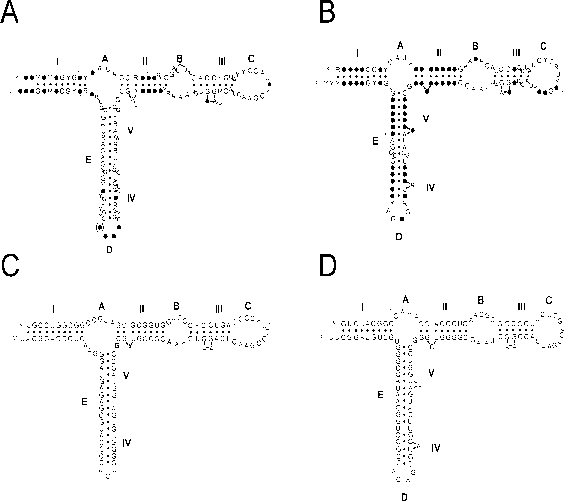 link with the wobble base of the P-site-bound tRNA (Prince et al., 1982). A number of mutations that strongly affect the ribosome activity have been produced in the region around the nucleotide C1400. As seen in Fig. 8.10, this region is mapped in the groove separating the 30S head from its body, on the side opposite to the bulge (platform). In addition to the footprints around C1400, the helices 938-943/13401345 and 923-933/1384-1393, that are known to reside in the 30S subunit head, are also found in the neighborhood of the P-site-bound codon-anticodon duplex, as indicated by the footprints at positions 1338-1339 and by the cross-link of G925 with the P-site-bound initiation codon AUG (Fig. 9.3). (4) The regions interacting with the mRNA codon located at the A site. This is the A-site part of the decoding center of the mRNA-binding site. As shown with the use of the site-directed cross-linking technique, the 5' nucleotide (position +4) of the A-site-bound codon of mRNA is in direct contact with the nucleotide C1402, while the 3' nucleotide (position +6) of this codon contacts U1052. These nucleotide residues are highly conserved. Their functional importance is confirmed by genetic data: mutations at position 1402 are lethal for bacterial cells, and the nucleotide 1052 is near the positions of well characterized mutations that affect A-site-related activities of the ribosome. The nucleotide next to the A-site-bound codon (position +7) is in direct contact with the nucleotide C1395 of the 16S rRNA. Deletion of its neighbor, the nucleotide A1394, abolishes the binding of tRNA to the ribosomal A site. It is noteworthy that the A-site-bound section of mRNA is in contact with the nucleotides 1402 and 1052 only when the P site is occupied with tRNA and the A site is free. After binding of tRNA to the A site these contacts disappear. On the whole, the base of the minor 3'-terminal domain of the 16S rRNA, precisely the imperfect double-helical region 1398-1410/1490-1505 (see Figs. 6.1 and 9.3), is often considered as the decoding center of rRNA proper, including both its A-site and P-site parts, i.e., the rRNA region mainly responsible for the retention of the two codon-anticodon duplexes. (5) The 16S rRNA regions interacting with mRNA positions downstream of the codon-anticodon duplexes (positions +8 - +12 of mRNA). These interactions seem to be important to fix mRNA in a correct way at the P and A sites. The first region from this group is near the nucleotide A1196 that can cross-link to positions +8 and +9 in mRNA (Fig. 9.3 long arrow up). The second region from this group is the co-called loop 530. Here the highly conserved nucleotides G530 and A532 are in direct contact with mRNA positions +11 and +12 (Fig. 9.3 two parallel long arrows down). The loop 530 has a unique spatial structure organized with two pseudoknots (see Fig. 6.1). Any disarrangement of the pseudoknots leads to decreasing of fidelity of translation. Some mutations in this region are lethal for the cell. It has to emphasize that all contacts of mRNA and 16S rRNA described in this section are universal and do not depend on mRNA sequence. At the same time, their formation and dissociation depend on binding of tRNA to the decoding center of the ribosome. Thus, several highly conserved regions of the 16S rRNA universal core (scattered in rRNA primary and secondary structure but apparently clustered in its tertiary structure) form multipoint contacts with mRNA (and tRNAs) providing a specific fixation of the ribosome ligands in the decoding center. A less specific retention of a polynucleotide along an extended path of mRNA on the small ribosomal subunit should not be neglected either. Figure 9.5. Scheme of the possible trajectory of mRNA chain passage through the ribosome. from the 50S subunit) side and near the side bulge (platform). Taking all the evidence into consideration, it appears that the mRNA chain binds to and passes along the 30S subunit somewhere on the boundary between its lobes or between the 16S RNA domains. 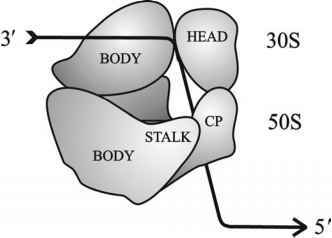 It is likely that the binding site is located in the region of the groove that separates the head from the side bulge and the head from the body (the "neck" region). The extended mRNA-binding region seems to contain many 16S RNA elements (including the 3'-terminal sequence and the minor 3'-terminal domain, helices at the base of the major 3' domain together with peripheral helices of the central domain, an internal helix of the major 3' domain, the last hairpin, or "loop 530" of the 5' domain) and several ribosomal proteins (such as S1, S3 and S5, and possibly S7). The decoding center retaining the codon section of mRNA seems to be located precisely at the thin "neck" of the small subunit. On the basis of general considerations it may be assumed that the association of the template polynucleotide with the ribosome permits a slippage of the polynucleotide chain along the mRNA-binding site. This is an obvious requirement for the sequential reading of the mRNA chain in the course of translation. The experiments have demonstrated that the ribosome protects 55 to 60 nucleotide section of mRNA from the attack by hydroxyl radicals (generated by Fe2+-EDTA); since the hydroxyl radicals attack mainly the sugar-phosphate backbone of RNA, the conclusion can be made that the ribosome interacts with mRNA along its sugar-phosphate backbone (Huettenhofer & Noller, 1994). This conclusion is quite consistent with the idea of the slippage of mRNA through the mRNA-binding site. The proposed position of tRNA residues on the ribosome (see below) and the possible trajectories of their displacements during translocation (see Section 12.5.1) suggest that the mRNA slips along the "neck" of the 30S subunit, more or less from outside and the L7/L12 stalk side of the ribosome to the subunit interface and the L1 protuberance side, as shown in Fig. 9.5. Pept(n)-tRNA' + Aa-tRNA''-tRNA' + Pept(n+1)-tRNA''. However, the ribosome catalyzes transpeptidation not only between these natural substrates. The antibiotic puromycin is an excellent low-molecular-mass acceptor substrate in the reaction (Nathans, 1964; Traut & Monro, 1964). By its chemical nature, it is an analog of the aminoacylated 3'-terminal adenosine h3c 7ch3 n n.